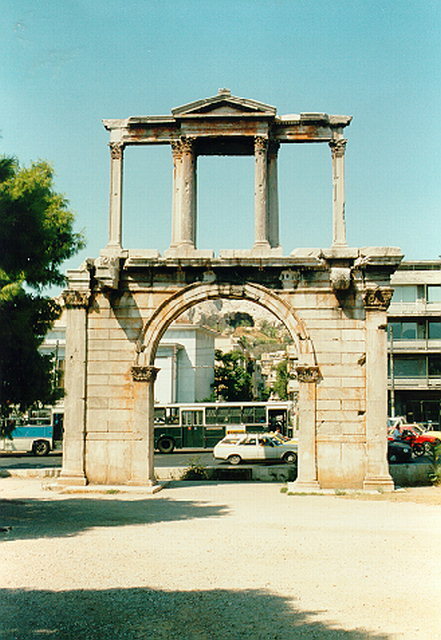 The triumphal arch lies on an ancient street that led from the old city of Athens to the new, Roman section, built by Hadrian. It was constructed by the Athenians in A.D. 131, in honor of their benefactor emperor. Two inscriptions are carved on the architrave, one on each side: the first, on the side towards the Acropolis reads "This is Athens, the ancient city of Theseus"; the second, on the other side, facing the new city reads "This is the city of Hadrian and not of Theseus".